Avenue K Shopping Mall is just opposite KLCC in hub of city centre and easily accessible through public transport too especially LRT. A ’Connecting KL’ was kicked off by Avenue K few months back involving Kuala Lumpur’s hip and trendy denizens. Finally, Avenue K was launched and officiated last week by Federal Territories Minister, YB Datuk Seri Utama Tengku Adnan bin Tengku Mansor to splendid fanfare and an impressive lineup of performances here in the city. Avenue K (AK) is Kuala Lumpur’s latest urban hub where trends, creativity and uniqueness are celebrated. Their tenants such as Muji, Cotton On, Original Classic, Sunglass Hut, Korea’s popular accessories store Redeye as well as French mega brand ELLE’s lingerie outlet. 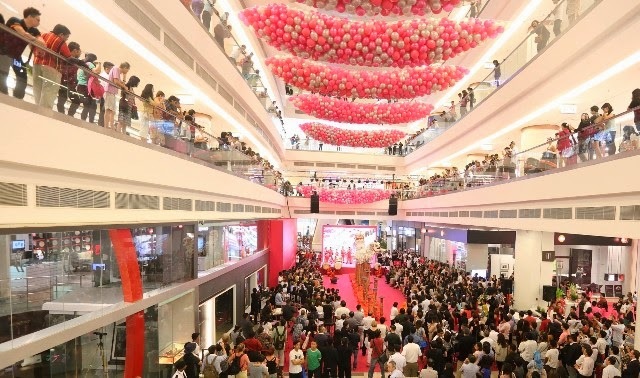 Swedish fashion giant, H&M at AK will not only showcase its sought after fashion wear but will also be the very first outlet to launch H&M Home in South East Asia in July. This hip brand is indeed the crown jewel of AK’s exciting array of tenants. Also offering stylish updates to your wardrobe with brands like Hush Puppies,G2000, Kitschen, Clarks, Midi, Nichii, Dressing Paula, among others, AK promises to provide the fashion savvy with a retail treat. High fliers can also jet in style at luggage specialists, Leather Avenue and Cosas United. Indulge in the best of the west at Grappa, Swensen’s, Ayer’s Rock Butcher & Grill, Fat Boy’s Burger Bar and The Loaf. Enjoy Americana inspired food Black Bull while deciding whether to go bowling, play pool or sing your heart out in their plush karaoke rooms. Relive the 60s with America’s most iconic burger joint, Johnny Rockets featuring the original hamburger and milkshakes on the ground floor. Savour the breathtaking KL skyline while you dine al fresco at Samba Brazilian Steakhouse Churrascaria, definitely a star attraction among KL’s tastiest dining options. Coffee connoisseurs need not play favorites as they can have a sip at Espressolab, Urbean, Delifrance, Starbucks and The Library Coffee Bar. Children of all ages will enjoy Discoveria which brings larger-than-life themed amusements for the whole family, beginning with Dinoscovery by Dinosaurs Live, an interactive and educational experience especially designed to engage the young. Thrill seekers can also now be entertained at Breakout on level 2 which caters to those seeking new adventures.